Mike Stevens was born on March 30, 1937, in Chicago, Illinois. He entered the U.S. Naval Academy in June 1955 and graduated with a commission as a 2d Lt in the U.S. Air Force on June 3, 1959. Lt Stevens next attended Undergraduate Pilot Training and was awarded his pilot wings at Laredo AFB, Texas, in July 1960, followed by Combat Crew Training in the F-100 Super Sabre in March 1961. His first assignment was to Biggs AFB, Texas, where he served with the 1st Aerial Tracking Squadron and 4758th Defense Systems Evaluation Squadron from March 1961 to July 1963. Lt Stevens was then chosen to serve as Aide de Camp to the Chief, Air Force Section, of the Military Assistance Advisory Group in the Republic of Vietnam. After graduating from Vietnamese language school, he served in South Vietnam as an advisor to the Vietnamese Air Force, flying 430 combat missions between November 1963 and April 1965. Capt Stevens returned to the United States to attend F-105 Thunderchief Combat Crew Training, and was then assigned to the 18th Tactical Fighter Wing (TFW) at Kadena AB, Okinawa, from July 1965 to June 1968. During this time, he flew an additional 304 combat missions while flying on Temporary Duty with the 67th Tactical Fighter Squadron (TFS), 12th TFS, 44th TFS, and 34th TFS at Korat Royal Thai AFB, Thailand. Maj Stevens next completed Army Command and General Staff College at Fort Leavenworth, Kansas, before being assigned as a staff officer with Headquarters Tactical Air Command at Langley AFB, Virginia, from June 1969 to July 1971. He then attended F-4 Phantom II Combat Crew Training and returned to combat with the 34th TFS of the 388th TFW at Korat RTAFB, Thailand, where he flew an another 118 combat missions between December 1971 and his return to the U.S. in February 1973. 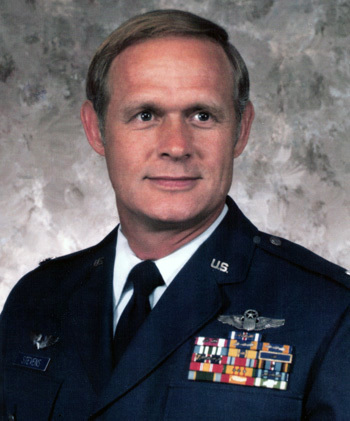 Col Stevens was next assigned to Headquarters U.S. Air Force in the Pentagon, where he served from February 1973 until his retirement from the Air Force on July 1, 1981. Col Stevens wears Command Pilot Wings and accumulated almost 4,300 flying hours during his Air Force Career. He also holds the record for the most fixed-wing combat missions flown during the Vietnam War, with 852 (over 365 of those were flown over North Vietnam). Captain Michael C. Stevens distinguished himself by heroism while participating in aerial flight near My Tho, Republic of Vietnam, on 9 May 1964. On that date, while serving as an advisor pilot with the Vietnamese Air Force, Captain Stevens discovered a concealed Viet Cong force and repeatedly directed his unarmed aircraft in close support of a friendly ground unit about to be ambushed by the Viet Cong. Through his heroic perseverance and outstanding professional airmanship, he braved intensive ground fire and successfully prevented the Viet Cong ambush unit from escaping until fighter aircraft could arrive. His actions were instrumental in saving many lives of the friendly ground forces and contributed greatly to the success of the attack against the Viet Cong force. The outstanding heroism and selfless devotion to duty displayed by Captain Stevens reflect great credit upon himself and the United States Air Force.